We as a race have been eating cherries since the dawn of time. It seems even our Neolithic ancestors used to make wine out of cherries before they turned to raisins. Cherries were also part of a legionnaire’s diet during the time of the Roman Empire. These days, we know that cherries are a great part of a balanced diet and even have antioxidant qualities. Another good reason to eat more cherries? They are now in season! But how can we keep them in order to enjoy them year-round? You’ll need some Mason jars on hand (with a 500 ml or 2-cup capacity). 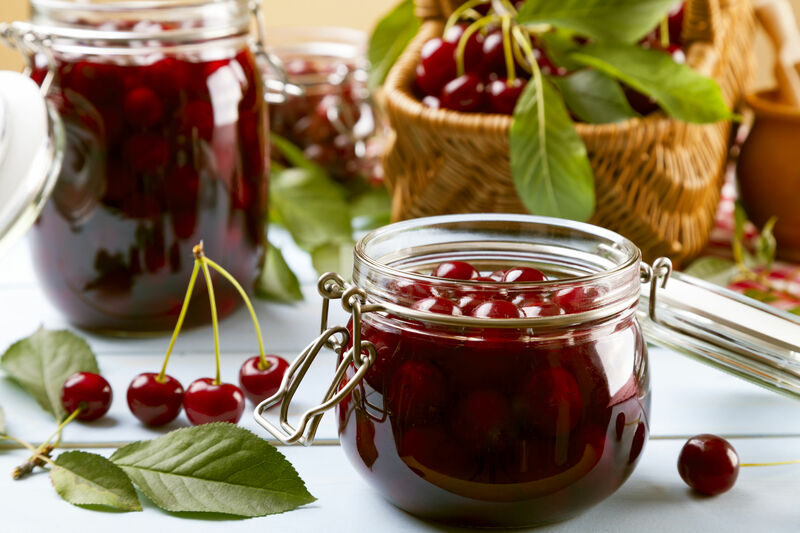 Be sure to use Bing cherries – make sure the cherries have a smooth, shiny skin. Fill the jars with the cherries. Pour enough 40% alcohol to fill the rest of the jar. You can also use any of your favourite alcoholic beverage. Tightly secure the lids onto the jars and place them in a cool, dark place for at least 3 months. These jars can then be cracked open and enjoyed as part of a dessert, eaten alone or given as gifts. Originally published in the Journal de Montréal on July 25, 2009. I did buy gorgeous cherries this week-end and followed the instruction. So far, so good. Cant’wait to open the jar in 3 months. Thanks for this simple tip and all the other ones on your wonderful site. « Eat real. Eat local.